Are women caught in a war between evolution and careers? (1) Women’s earning potential is increased by getting married later. That means that only one out of four children has their biological parents in the same house until they are eighteen. The optimal age for conditions to be met results in a 2-3 year discrepancy in the ages of partners. 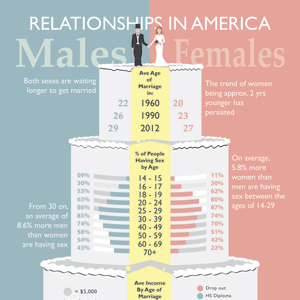 The highest earning demographic are women who have never married and have a college degree. The flags of a productive female workforce are raised, and once set familial boundaries are more porous than ever. But why do the casualties have to be kids?